Yaroslav is Advisor to the Prime Minister on parliamentary relations (July 2017 – to this day); Strategic Advisory Group on Reform Support in Ukraine (SAGSUR), (May 2016 – to date); Ministry of Economic Development and Trade of Ukraine, (May 2015 – till now); Advisor to the Minister for Government Affairs and Parliamentary Relations; Anheuser-Busch Inbev, (February 2014 – May 2015) Government Advisor, Member of the Board of Directors; Kesarev Consulting, (November 2010 – February 2014) Senior Government Advisor. Expertise: parliamentary activity, government relations/public affairs, communications. 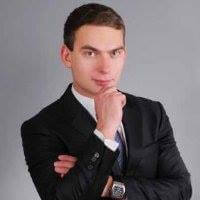 Yaroslav graduated from the Institute of International Relations of the Kyiv National Taras Shevchenko University (2013), Master’s degree and the Institute of Law of the Verkhovna Rada of Ukraine (2009).